Taking a few days off for Passover. Eager to see how my mom will appease/reward the little ones (we’ll have seven of them under eight attending) after the afikoman hunt. 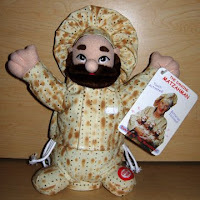 Here’s an image of a previous year’s gift: All hail the Dancing Matzah Man!